Buy Chebulic Myrobalan (Indian Gall-nut) - Terminalia Chebula Raw Herbs - Useful remedy for Cholesterol normalizing, Chronic diarrhea and dysentery. Botanical Name : terminalia Chebula. Tamil Name : aivi, aiyam, aiyavi, amagola, arabi, aridabi, aridadi, attan, Katukkai, kadukkai, kadukkai poo, kadakai, kadookai, kaduk-kai, kaduk-kay-pinji, kadukkai-poo, kadakkai, tiripalati, kadukkaai, kadu, kadukkay, kagodagasingi, katukkay, kaduk-kay, kadukai, nechi, pattiyam, piradamai, pinchu-kadukkai. Common Name : myrobalan, hardad, chebulic myrobalan, ink nut, the ink tree, indian gall-nut, gallnut. Sanskrit Name : abhaya, amogha, amritha, amruta, avyatha, balya, bhishagvara, bhishak-priya, bhishakpriya, chetaki, chetamaki, devi, divya, girija, haimavati, haimayathi, haritaka, haritakee, haritaki, himaja, jaya, jivanika, jivanthi, jivanti, jivapriya, jivya, karkatasringi, kayastha, nandini, pachani, panjarasa. Hindi Name : harada, hara, harad, harara, harra, pile-har, harir, halda, har, harb, harash, haira, harar, harrar, harhar. Malayalam Name : divya, katuikka, katukka, kayastha, putanam, kadukka, divy, kadukai, kadukkai, katukkaya, kodakka, kodorka. Kannada Name : alalc-kayi, alale, alalekayi, anile, arale, harade, haritaki, harra, karakkayi, aralaikai, halle, arili, alale kaayi, alale pathya. Arabic Name : halilaj, halilaje-asfar, har, harda, pila har, kala har, halela zard, halela siah, halela kabuli, har siah, har kabli. French Name : badamier chebule. German Name : rispiger myrobalanenbaum. 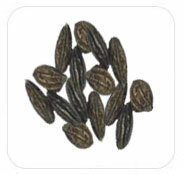 It is proved to be useful for treating asthma, cough, piles. It is also used for healing the wounds and is more often used as the gargle against the mouth's inflammation of mucous membrane. Terminalia Chebula is excellent for the digestive system. As a preventative supplement it has great anti viral attributes, as shown by its antitumor and HIV action. It contains a constituent which has a wide anti- bacterial and antifungal spectrum, and also inhibits growth of E. coli, the most common organism responsible for urinary tract infection. Terminalia Chebula effective for alleviating constipation in general, and is helpful for vata persons because it works in the triphala formula, which is a well-balanced digestive and rejuvenating aid. Terminalia chebula can be used in case of all types of eye disorders such as conjunctivitis, inflammation. Terminalia Chebula has a strong effect against the herpes simplex virus HSV, has antibacterial activity and exhibits strong cardio tonic properties. 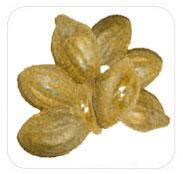 Terminalia Chebula also has antioxidant components which indicates it can increase the life of tissues. The plant is used extensively in the preparation of many ayurvedic formulations for infectious diseases such as chronic ulcers, leucorrhoea, pyorrhoea and fungal infections of the skin. Haritaki is said to have strong anti-bacterial properties. It is revitalizing, toning, nourishing and astringent when used in skin and hair care formulations. It is an effective purgative and helps in removing toxins and fats from the body resulting in their reduced absorption. Chewing a piece of chebulic myroblan is also an effective remedy for heartburn. 1.Chebulic myroblan is effective remedy for piles. The fresh fruits should be fried to a golden brown color in castor oil, powdered and stored. Half a teaspoon of this dissolved on the tongue at bedtime brings about normal bowel movement in the morning and its astringent property heals the pile masses. 2.As a mild laxative, chebulic myroblan is beneficial in constipation. Either the pulp of 2 to 3 fruits with a little rock salt or a decoction of 6 fruits and 4 grams of cloves or cinnamon, should be taken daily at bed time to relieve constipation. 3.It is useful in skin disorders like chronic wounds, ulcers and scalds. A fine powder of the fruit mixed with carrion oil-made from fat of an animal- makes an excellent ointment for burns and scalds. 4.The use of a diluted decoction of chebulic myroblan is a popular gargle for mouth inflammation. The paste of the fruit mixed in thin buttermilk also makes a very effective gargle in gum inflammation. The powder of the fruit when applied directly on the painful tooth gives relief. 5.It is also a valuable remedy for chronic diarrhea and dysentery. Four grams of the pulp of the unripe fruit is given with honey and aromatics such as clove and cinnamon twice a day in the treatment of these diseases. 6.A decoction of the herb is useful in vaginal irritation and inflammation. It should be used as a douche to wash the vulval parts. When there is thick white discharge, washing the part with a decoction made with neem leaves and chebulic myroblan fruits will help greatly hebulic myroblan is useful as a hair tonic. A paste of the fruit is boiled in coconut oil till its essence completely dissolves in the oil. This oil is used regularly gives vitality to hair. Cheublic myroblan decoction is a popular hair rinse which many women use to blacken grey hair. 7.A dilute decoction of chebulic myroblan used as an eye wash helps to relieve eye congestion. The fruit being astringent, decreases swelling and inflammation. General Uses: Cytoprotective effect on oxidative stress and inhibitory effect on cellular aging of Terminalia chebula fruit.Antioxidant and free radical scavenging activities of Terminalia chebula.Haritaki reduces the ill effects of fat rich, creamy and oily food. Terminalia chebula is the definite aid for persons who habitually overeat. Further it can supplement the Cholesterol normalizing drugs.It is a good nervine. It is used in nervous weakness, nervous irritability. It promotes the receiving power of the five senses.Its decoction is used as gargle in oral ulcers, sore throat. Its powder is a good astringent dentrifice in loose gums, bleeding and ulceration in gums. Description: Terminalia Chebula is called the "king of medicines" and is always listed first in the Ayurvedic meteria medica because of its extraordinary powers of healing. In Ayurveda it is considered to destroy all diseases and eliminate all waste from the body. At the same time, it is known to promote tissue growth and health.It is a moderate or large deciduous tree, attaining 25-30 m in height. Leaf buds, branches and youngest leaves are covered with soft, shining rust coloured hairs. Leaves 7-20 cm,glabrous, opposite, elliptic-oblong, rounded,acute apex. Flowers bisexual, white or yellow with an offensive smell. Fruit is a drupe, pendulous, 2-4 cm long, obovoid from a broad base, glabrous, sribbed, when dry, yellowish green, bark 6 mm thick, dark brown, many generally shallow vertical cracks.